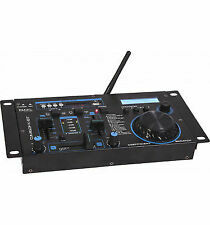 Ibiza DJM90USB-BT 5-Channel Mixer USB SD Bluetooth Rack. Ibiza presents the DJM90USB-BT: an inexpensive, yet fully functional, entry-level mixer. Complex 5-channel mixer with a black finish. Layman-friendly 5-channel mixer with Bluetooth, USB and SD slots as well as a microphone section. Headphones output with CUE monitor. 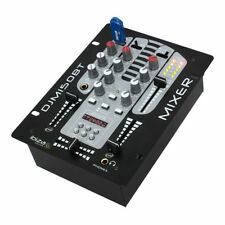 Versatile 2-channel tabletop mixer featuring 5 inputs, MP3 USB & SD ports. 2x switchable MP3/LINE1 and PHONO/LINE2 channels. Master channel. 2 input mixer. 8 built in sound effects. twin 10 band graphic EQ. 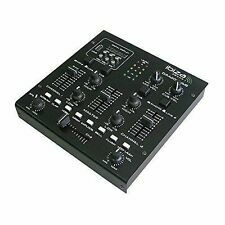 Ibiza DJM-102 Pro 4 channel mixer 10 band EQ battle effects LED lights. 10-band EQ for main output channels for fine tuning of the mix and endless creative opportunities. Equalizer On / Off Switch. A top mounted microphone input with 3-band EQ allows for voiceovers and a further microphone input round the back is perfect for either an MC or even for Karaoke. Versatile mixer for the starting DJ. Also suitable for Karaoke applications. Headphone CUE. 4 ways / 7 channels. DIGITAL display. MIXER IBIZA. Marke Ibiza. Produktlinie IBIZA. • Switchable inputs: 2 phono, 2 line, 1 x USB-MP3 player with digital display. Weight: 2,2 Kg. Analog/Digital Analog & Digital. Anzahl der Einheiten 1. Anzahl der Kanäle 5. 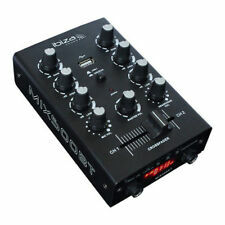 Ibiza MIX500 2-Channel Mini Mixer 2-Band Equaliser Black. 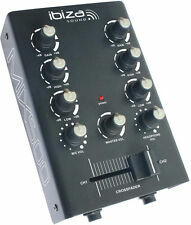 Ultraportable 2-channel mini mixer. The MIX500 is an ultra-portable2-channel mixer fromibiza. Connections: 2 x stereo RCA line input, 1 x 6.3mm jack microphone input, 1 x stereo RCA master output, 1 x stereo RCA record output, 1 x 6.3mm jack headphone output. 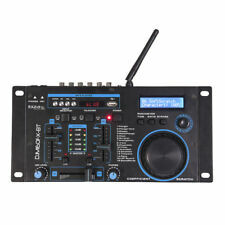 Ibiza DJ-21 2/3 Channel USB DJ Mixer with Talkover. 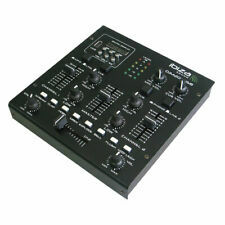 Ibiza DJ-21 2/3 Channel USB DJ Mixer. 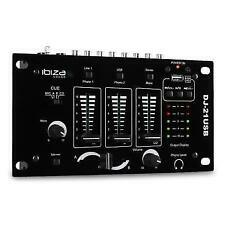 TheIbiza DJ-21 is a perfect entry level mixer for those who want to get started DJing or have a tight budget. Ibiza MIX500 Mixer. Dispatched with Royal Mail 2nd Class. MPN MIX500. Modell MIX500. Marke Ibiza. Produktlinie IBIZA. MINI MIXER. There one or two audio devices can be connected to the mixer to mix their music. Trust our years of experience - Known from Hobby Hifi and sound sound. IBIZA MIX500BT. Modell MIX500BT. Marke Ibiza. Produktlinie IBIZA. 2-channel mixer with 3 inputs, USB, crossfader. Trust our years of experience - Known from Hobby Hifi and sound sound. -With power adapter. 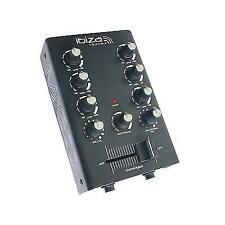 Hi i have an Ibiza DJ-21USB mixer for sale. cant get the usb to work but not sure if its user error. missing 2 sliders.